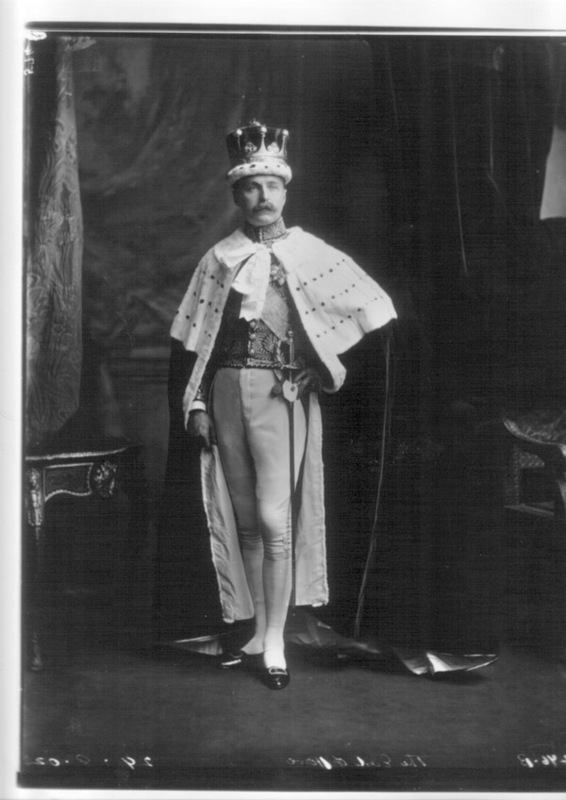 Sir Richard George Penn Curzon-Howe, 4th Earl Howe (1861-1929). Sitter: Sir Richard George Penn Curzon-Howe, 4th Earl Howe (1861-1929). Biog: Conservative M.P for Wycombe division of Bucks 1885-1900; Treasurer of H.M. Household 1896-1900; Lord-in-Waiting to Queen Victoria 1900-1901 & King Edward VII 1901-1903; Lord Chamberlain to Queen Alexandra 1903-1925. Costume: Peer's robes over Full Dress, H.M Household Uniform (2nd Class ?). Orders, Decorations & Medals: Star of the Order of Leopold [Belgium]; (others not visible). Biog: Burke's Peerage; The Complete Peerage; Who's Who; The Times 11 January 1925, p. 11 a. Orders, Decorations & Medals: R. Werlich, Orders and Decorations of All Nations, Washington, 1990.